At some point this year, my selection of open whisky bottles turned into Kravitz's Cabinet of Curiosities. While I do enjoy having an occasional oddball bottle to share, there are too many of these open right now. I lugged a box of them to a whisky friend's house last week and felt like I should have donned a top hat and commenced carnival barking. From the Cabinet of Curiosities, I present The Bearded Lady. Yes, that's a champagne cork in its whisky hole. As you can see, the immediate appeal is the rockin' bottle. The bigger appeal for me was that it's a Japanese whisky that's been out of US circulation since the first Reagan administration. After completing the sale, the woman behind the counter said that her husband would call in to get it restocked. I said, good luck with that. As I drove home with the bottle wedged upright behind my seat, I suddenly noticed that my car smelled like whisky. As in, a lot of whisky. As in, I-probably-don't-want-to-get-pulled-over-by-the-fuzz a lot of whisky. When I got home and lifted the bottle, vapors of warm malt oozed forth. I noticed when I had bought the whisky that the fill level was a little low (see pic above) but What The Hell? There were little whisky bubbles forming around the closure. Yet with its intricate rope-bound top, it was still technically sealed. The cork had been almost entirely eaten away. There were some crumbs around the bottle neck, but nothing appeared to be inside the bottle. It had become part of the whisky. And then I drank it. And I was reminded of the time that Homer Simpson was told that he'd just drunk a sample of dish detergent and he responded with a shrug, "Yeah, but what are ya gonna do?" But that's about it. Pete Lawford's bottle shows a measurement in quarts, mine has metric. Thus my bottle is post-1978 and probably post-1980 when metric measurements became used for US booze. The listing of proof rather than ABV, the paper seal, and the lack of government warnings shows it to be from the early 1980s. Regarding the ingredients, the label only says "Distillery at Yamazaki, Near Kyoto, Japan". Could this be a blended malt? That technical nomenclature didn't exist 30 years ago. Did Japanese whisky companies use the term "Pure Malt" back then, or was any sort of blend just called a "blend"? I know that Suntory currently has a grain facility called Chita, but I've been unable to find out when it was built. If anyone knows, please share! If Chita wasn't built at the time, and if there is grain whisky in the SR, could it have been distilled at Yamazaki too? I honestly don't know. The color is a medium gold with a reddish tint. The nose starts with watermelon candy, cherry candy, and tropical fruit candy. Not the actual fruits, but the manufactured flavors. Then an Abba-Zaba but with more vanilla. Sherry takes a while to show. As do some mothballs. It still has bit of an ethyl nip even with time and oxidation. Something papery lingers throughout. Finally, there's an occasional rotten strawberry note that peeks out then vanishes quickly. The palate goes from paper → tobacco → malt → bitterness. Also a piece of tart citrus-flavored saltwater taffy (if that's a thing). It gets very sweet over time. And then there's that occasional bizzaro note that makes the drinker's face purse up; somehow it's both synthetic and rotten at the same time. Luckily, it remains in the background. Some moldy sherry appears in the finish, as does some tartness, the nose's fruit candies, and something like smoky paper. After a while it gets cloying like a really sweet liqueur. The nose starts with a cross between orange oil and locker room. Then caramel, vague raisins and prunes. The watermelon candy and mothballs are still here. And maybe some of that moldy sherry? The palate has hints of sherry, some bitterness, some brown sugar, malt, and vanilla. The texture is nice and thick. But then there's that synthetic-yet-rotting note. The finish ends up tart and bitter, mostly modulated, but not always pleasant. Prunes, vanilla, and caramel. And a little plastic. Well, I'm still here. And I've tried a bit of this stuff. No calls to Poison Control. Are those odd notes due to the cork? My guess is, probably. What's impressive is that even with untold years of oxidation, the whisky is still very flavorful. Without those rotten synthetic thingies, this could be a solid B-grade whisky. I don't think water does it any favors, but it makes an acceptable mizuwari [Correction: mizuwari bad]. All things considered, this could have been much worse. One final thought. A dusty hunting tip. Before you buy a dusty bottle of booze, take as good of a look at it as the store owner will let you. Check out the seal, the information on the label, and the fill level. Even though that old whisk(e)y you've found is cheap, it's still something that becomes yours. It'll be in your cabinet and, eventually, in your mouth. If you can smell whisky from across the counter, and that scent isn't coming from the cashier, then maybe you should just buy a lottery scratch-off ticket and call it a day. Pricing - ?? ?, I found mine for $25.99 but who knows what it sells for elsewhere? My knowledge of Japanese whisky is probably on par with yours but I have a feeling that if it's labeled a blend, it is a blend of malt and grain whisky. The Japanese whisky industry is closest in style to Scotland so it's very likely labeling will also be similar. I wonder how this compares to say, Hibiki 12? Yeah, I agree that it's probably a blend. I wonder if Yamazaki used to do their own grain whiskies as well. Nikka's Miyagikyo distillery does both malt and grain. I found the SR more malty (and weirder, of course) than Hibiki 12, but that's just from memory. I may do a more official comparison in the near future. Thanks for that question. From what I understand, Japanese whisky companies are almost entirely self-contained, unlike their Scottish counterparts. This is why their malt distilleries have such a wild variety of different stills - they have to produce all of the different styles of malt necessary for blending 'in-house', because casks aren't traded between companies. From a little bit of poking around, it sounds like Suntory does most of their grain distilling at Chita under their Sungrain subsidiary, but a more experimental grain distilling facility was recently opened at Hakushu. That's cool, maybe they're trying out new things with the Hakushu grain facility. I just it doesn't result in a $300 NAS Japanese bourbon. Anyone know when the Chita facility was built? Certainly looks like you do! For me, Yamazaki is their gem. Hi Steven. First of all, good luck with that bottle. I hope it was sealed well. Here's the bad news: This whisky descended in quality from a score of 75 to 71 to 69. Here's the possible good news: This quality issue was possibly due to the fact that my bottle was sealed very poorly for almost 30 years. Suntory still makes a blend today that uses a similar bottle shape. I haven't tried that one, so I don't know its quality. In Australia . We pay high taxes on Tobacco and liquor products . Also the perceived increased costs due to a brands reputation and subsequent demand , further inflates the prices . That's when I stumbled on the Suntory Royal Whiskey . It would seem to be a recent release with same bottle but slightly different label from the images on the Internet . I am now very intrigued and actually excited about the arrival this bottle. http://email.mybottleshop.com.au/t/t-l-iydrkyk-iultldklt-d/ , I actually found a Ballantines 17 Yr old Scotch whiskey too . Have you ever tried the Ballantines ? Oh yeah, that's right. You guys have really high prices on liquor over there. My wife had a business trip there a few years ago, but I didn't ask her to bring any whisky back because it was so pricey. Ballantines 17yo is a very nice blend and is about as good as a large-release blend gets nowadays. It's not complex but it's a very good drinker. It's twice the price here than it is in Europe and Japan, which is why I don't own a bottle. Your prices seem to fall somewhere in the middle. My brother and I are drinking the Suntory Royal Blended Whiskey . It is magical . wow . Beats Johnny Walker Blue . I'm a sucker for most Japanese blends, so I'm glad this one is good! And I'm even more glad that it's better than JW Blue. Enjoy! Hi Joanna. Thanks for your comment! Here's a link to my more positive review of Suntory Royal. The problem with this whisky was likely related to the bottle and oxidation. Having now had the untainted SR, I agree that it's a very good blend. When I was in Japan this year, I did see the current version of the SR on the shelves. You probably heard correctly about its demand. People are seeking out Japanese whisky and this one is much cheaper than the single malts. That's cool. Actually the mini I had (reviewed here) was quite good. Enjoy! Pardon the pun... dusting off this old review since I stumbled upon an unopened bottle of the Suntory Royal and happened on your review while hunting for information. I haven't opened it yet but hope I can be objective after reading this. Thanks! P.S. Glad to have stumbled upon your blog. I appreciate the content! Thanks, Luke! I have good news for you. If the bottle's cork and seal are in decent shape and the whisky didn't oxidize, then the blend is pretty good. I have another review here of what it should taste like. I have had an un-opened bottle in my cabinet for several years. It is on my bucket tasting list. Hard to find current price. Bill in Grand Rapids Mich.
Hey Bill. The good news is if the seal isn't corrupted then this is a very nice blend. Here's my review of the unspoiled version. Good luck with your bottle! Hi I have a bottle of this blend for approximately 40 years ,cook looks OK has a little black thing under cork and liquid is only to top of gold label ,so has this evaporated or is that how full it original was ,going to try it soon ,any comments would be good . Hi Anonymous. Good question. Most of the old Suntory SRs I've seen all have their fill level about where yours and mine were. 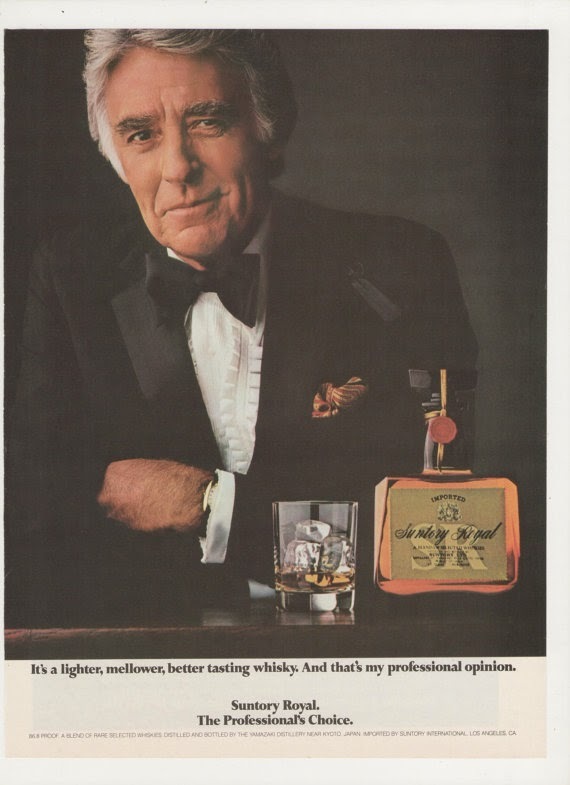 I did get a chance to try a 1980s mini of SR and found the whisky to be very good, better than the bottle I reviewed in this post. You can always give your whisky a try. Part of the problem with my bottle is that it was likely on a shelf in the warm sun for 30 years. If yours was stored in a cabinet, not in the sun, you may have better luck. At least the bottle looks nice!